If you’ve been told you should be switching to a kneeling chair, but have been holding off because you’re concerned that you won’t be able to maintain a full day at a time, Flash Furniture have the option for you. Taking one of their standard wooden kneeling chairs, and providing it with some extra back support in the form of a reclining backrest. Getting to the backrest later, the kneeling chair section of this product is fairly straightforward. The frame is a standard scissor design made out of wood and sanded and varnished to provide a neat finish. The frame is held together by a standard arrangement of bolts, including those used to keep the seat and knee rest in place. Four caster wheels provide the flexibility of movement in any direction while seated. A screw mechanism below the seat allows one to lift and lower the height of the seat. Easy to adjust, but locking in place while seated. The backrest attaches directly to the seat and has a mechanism in it to allow it to support you, regardless of the angle of the chair. The total weight of the chair is 21 pounds, and including the backrest will come to a height of 31 inches. When shipped, the product comes packaged in a box. Assembly is required and the resulting chair measures 18 inches wide and 30 inches long. The chair’s biggest feature is its backrest. While many move away from a traditional chair to improve their posture, and feel that part of that is the lack of a backrest, this is only half true. Sitting on a kneeling chair helps distribute your weight differently. 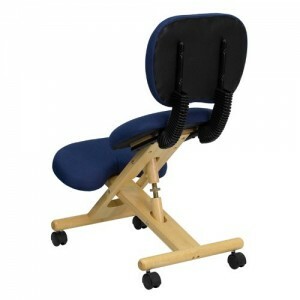 Furthermore, the backrest provided is very short, providing only a bit of support to your lower-back, still requiring you to keep your posture. If you tried to lean back on this like on a normal chair, you would end up falling over backwards. The chair’s seat, backrest and knee rest are all padded with a thick foam seat, and covered in a navy-blue fabric upholstery. The cushions are sufficient for most people, and the fabric hard wearing. While we like the overall design of the chair, a number of customer reviews have called its build quality into question. While the chair specifies that it is only for people with a weight less than 200 pounds, the wooden design and cheap components do not seem to be that durable, with many people having product failures after three years of use. If you weigh less than 150 pounds, the chair will most likely last much longer and you can buy the chair without fear, but for anyone larger, be aware that at some stage the chair is likely to break on you. If you’re specifically looking for a chair with a backrest, perhaps consider purchasing a different chair, and finding a backrest as an attachment.